This easy-to-make tuna salad tastes great on a wholewheat pita or even with some brown rice or quinoa. You can store this salad for 2/3 days in an airtight container. Grab a bowl and remove the tuna from the can. Put the tuna in the bowl and chop up the pickle, (finely) the onion and the capers. 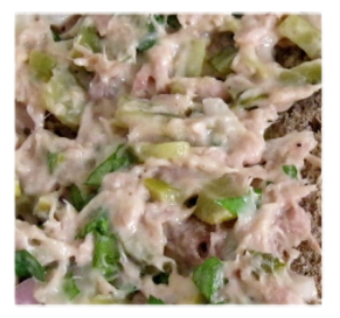 Mix the mayonnaise with the tuna and add the chopped pickle/capers and onions. Season with salt and freshly ground black pepper. Spread the tuna salad onto the two toasted wholewheat pitas and garnish with some parsley or coriander. Optional: before you mix the tuna with the mayo, add some lemon juice to the tuna.